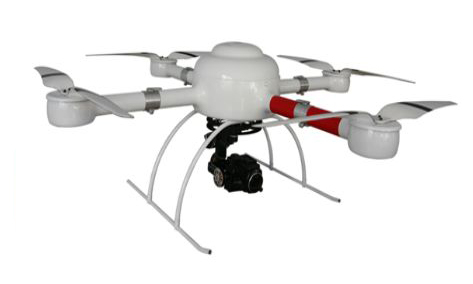 Now a new type of application is emerging quietly, among which the four-rotor UAV is the most representative, and this kind of application is increasingly favored by amateurs. Drones are also being considered for commercial applications such as surveillance. Of particular importance to these applications is the dynamic response of the BLDC motor controller and its ability to smoothly control the BLDC motor at low speeds and without sensors. Use the micro electric motor to control the electric stirrer, ensure multi-point setting for the rotating speed and working periods so that the rotating speed customization can be randomly displayed and the actual rotating speed can realize continuous multipoint automatic speed regulation. Meanwhile, it is capable of giving an alarm in terms of speed abnormality automatic alarm and cutting off the power source for linkage. Since the close-loop negative feedback is introduced to control the electric appliance, the anti-jamming capability of the stirrer can be enhanced. The electric screw driver is an electric tool used for tightening and loosening the screw. The electric tool has the mechanism of regulating and limiting the torque, which is usually used for wire assembling. It is one of the requisite tools of most manufacturing enterprises. For people usually using the electric screw driver, noise is the biggest trouble of them. From the perspective of the customers, what can we do to solve the noise problem? 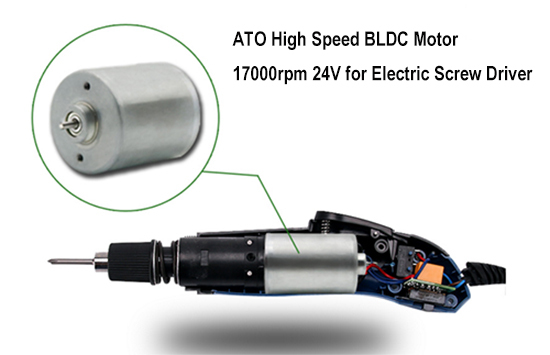 The following paragraph ATO introduces the scheme of the screw driver for the magnetic brushless DC motor. The driver is made up of the power electronic device and the integrated circuit. It functions to control the launch, stop and braking of the electric motor by receiving the launch, stop and braking signals of the electric motor. Meanwhile, it can receive the position sensors' signals and signals of forward or backward rotation to control the on or off of the power tubes of the inverter-bridge, thus generating continuous torque. Last but not least, by receiving the speed instructions and the speed feedback signals, it can control and adjust the rotating speed, and provide protection and display. Why Choose a Water Pump with BLDC Motor? The BLDC water pump is made up of the BLDC electric motor plus the impeller. The axis of the electric motor and the impeller are connected. The BLDC motor water pump adopts the electronic commutation and requires no carbon brush commutation. The high-performance abrasion-resistant porcelain shaft and porcelain axis sleeves are employed. The axis sleeves avoid the abrasion through integration between axis sleeves and magnetic iron via injection molding. Therefore, the performance of the BLDC motor water pump is greatly enhanced. The stator part and the rotor part of the BLDC motor electric are fully separated from each other. The stator and the circuit board adopt the epoxy resin for embedment to ensure 100% waterproof. The stator part adopts the permanent magnet, which has a low noise, small volume, and steady performance. Through the stator winding, various required parameters can be regulated. Additionally, the wide voltage operation is allowed. A major method for energy conservation of the air-conditioning system is to monitor the value of users' cold load and regulate the output of the air-conditioning system's refrigerating capacity. Through rotating speed regulation of the compressor, water pump and draught fan, the output of the air-conditioner's refrigerating capacity can be regulated. This method to regulate the balance between supply and demand can improve the energy's utilization efficiency and avoid waste of the electric energy. In this way, how to control the rotating speed of the compressor, water pump and draught is a critical issue facing the air-conditioner's energy conservation. Traditionally, the server adopts the 12V BLDC motor fan to cool down the electronic equipment in the refrigerator. However, just like the automobile application, the 54V BLDC motor electric motor is also applicable to the server for several reasons. This article mainly discusses two major reasons why the server manufacturer adopts the 54V BLDC motor rather than the traditional 12V BLDC electric motor. Combined with the working characteristics of the self-propelled aerial working platform, permanent magnet brushless DC motor is currently selected as the driving motor in the mainstream of the aerial working platform. So, what are the advantages of permanent magnet brushless DC motor? Permanent magnet brushless DC motor is generated and developed with digital control technology, therefore, SCM and DSP based digital control is the main control means of brushless DC motor. 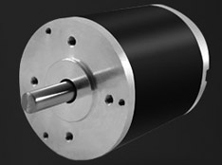 Permanent magnet brushless DC motor mainly completes the following aspects of control. Nowadays, the drive motors of household appliances are divided into AC motor and DC motor, and DC motor is divided into DC brushled motor and DC brushless motor. Due to the progress of material science, the research and development of brushless DC motor (BLDC) and its production have made considerable breakthroughs in recent years. Brushless DC motor has the characteristics of quiet, noise-free, maintenance-free, long life, small size and advantages. Especially high efficiency input/output ratio, it has excellent performance in energy saving and environmental protection.